Large Teenage Classes: some strategies to enjoy the lesson! Note from Barb: A few days ago, I wrote a short post for the iTDi blog about teaching large classes. I was fascinated by the Englishometer that Valentina mentioned in her comment, and asked if she’d consider sharing more of her ideas in a guest post here. Lucky for us, she agreed! About ten years ago (when I graduated), if you had told me I would spend a significant part of my life teaching English to young people, I would have been surprised, a little shocked. To be honest, at that time teaching English was not my dream. I always loved the language, the culture and the literature, but never before had I thought I could be a teacher. It didn’t have anything to do with the language, I was just afraid of managing thirty young boys all together, only me and them in one room. So I started working in a big international company. My role was to implement communication plans and run workshops for managers. After two years I realised I was not getting anything back. In terms of values and human relationships, I mean. So I decided to go into teaching. Basically it was moving from an impersonal environment into a strong human-focused one. Engaging human personalities and emotions, this is the main reason why I came into teaching. Just ask! – Quite often teens complain about everything (especially about lessons) so I started to involve them in the decisions by giving them a questionnaire at the beginning of the school year. I only ask a few questions: What stops you from speaking English? How do you prefer to speak (pair work, group work, etc.)? What do you talk to your friends about? Generally, my students prefer pair work and talking about personal experiences, cinema, sports, computers, and music (like most teens around the globe). – get some students to repeat instructions in L1. This is really motivating for them, and I always try to pick different students. – provide them with a model on the board and on the handout. If the model is clearly visible to them, they would only need to quickly look at it during the activity instead of asking other classmates or the teacher. – get some students to actually do the activity as a model. I always choose volunteer students for that. They enjoy it, and it is also a good ice-breaker! Avoid boredom! Use pictures and graphics – Once I have chosen a topic that is relevant to students, I look for interesting pictures that can capture their attention. To be useful images should be real, updated and easy to look at. If you can’t print coloured pictures, just show them on the screen or simply print a big coloured one to put on the wall. To get students attention I often try to link pictures to personal anecdotes (not always a real one!). I use pictures in many activities: tell a story, make a game, create a song, imaginary interviews. I also started to use graphic organisers. I usually draw a big ‘S’ on the board and then I put a series of images on top of it, like different stops on a track. You can use it with stories, anecdotes, films or real life. In my experience pictures and graphics work quite well with teens because they find them real and motivating. Students are curious, they show genuine interest, and they have real reasons to speak. In the company I lacked that sense of fulfillment that gives you the motivation to move on everyday. When you love English and you think you could give your personal contribution to someone’s development then you start thinking how satisfying teaching can be. Note: This article by Valentina Morgana originally appeared as a guest post on Teaching Village, and is licensed under a Creative Commons, Attribution-Non Commercial, No Derivatives 3.0 License. If you wish to share it you must re-publish it “as is”, and retain any credits, acknowledgements, and hyperlinks within it. 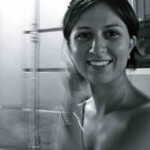 Valentina Morgana has been teaching English to young learners and teenagers in Italy for 7 years. She is studying for the Cambridge DELTA. She is passionate about English and young learners. She is strongly interested in web 2.0 and introducing technology in the language classroom. You can follow her on her blog, ELT traveller box, and on Twitter (@vmorgana). Thank you, Valentina, for being willing to share this. I still love the Englishometer, and now have even more things to try out in class. I know that other readers, especially those who teach teens, and especially large classes of teens, will find some useful tips as well! Thanks, Barbara. I think sharing classroom ideas and positive experiences is a great way to learn from each other. I hope these ideas can be useful for other teachers as they were for me :-)! Thanks for these valuable ideas,I have been teaching with large classes,too.Sometimes when I get home,I have no energy for speaking or listening:( My students take all my energy but I love teaching and being challenged. I would like to learn more about Englishometer,is it a picture,tool or you draw it to the board? Hi! I know the feeling, at the end of the week I feel like I could sleep for 48 hours till Monday morning :-)! I usually get a couple of students to draw the Englishometer on a side of the board, or sometimes we put it on the wall. It looks like a big arrow with a scale from 0% to 100%. many thanks for your comment. I think monitoring is the key issue here. If your students get used to be monitored during speaking activities, they will definitely be honest while compiling the self-assessment cards. They know we are there to see how they are dealing with the situation, and also to help them.